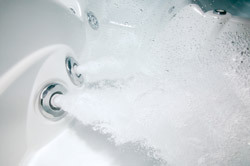 Teddy Bear Pools & Spas experienced Hot Tub delivery team will deliver, set up, and install your new Hot tub. And, before they’re gone, if you’re electrician did his job, they’ll fill it, and show you how to use it! This service is another example of our commitment to our customers. Teddy Bear Pools & Spas wants to make sure that we leave you confident in your ability to safely and easily enjoy your new purchase. You bought a spa to RELAX, right? To find out more about what we can do for you, please fill out our contact form, or call us at 413-594-2666 ext. 143 and we’ll get back to you as quickly as possible.